With their last salute Tuesday afternoon, members of the local 525 Chapter of the Military Order of the Purple Heart accomplished a 10-year effort to memorialize the 22 locals who died in action in the Vietnam War. In Veterans Plaza at Myrtle Hill Cemetery, the veterans of the order stood alongside the monument, on which the 22 names are engraved beneath the Purple Heart military decoration. Just below the two columns of 11 names, a sentiment speaks to the sacrifice of those the monument honors. “All gave some,” it reads. “These gave all.”Lesley S. Ayers, Larry K. Wheeler, Alexander B. Blanton, Leroy B. Webb, James A. Brock, Eddie L. Spivey, William L. Covington, Johnny W. Sitten, Donald W. Dixon, Tommy Q. Segars Jr., William W. English Jr., Joseph S. Prince, William E. Finley, William G. McWilliams III, William R. Fowler, Richard L. Justice, Johnny E. Gantt, Thomas S. Jones, John D. Gollahon, Joseph Hillman, Judson Hall and Albert J. Hayes. 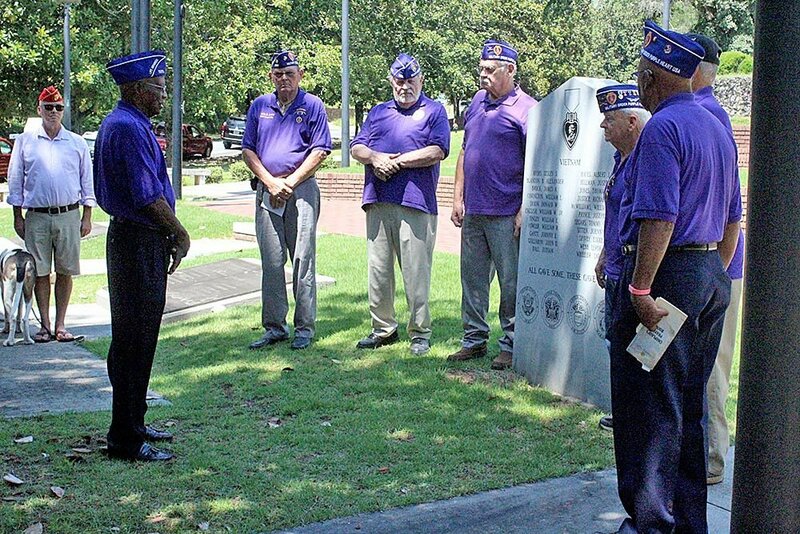 Relatives and friends as well as fellow service members attended the ceremony, which marked National Purple Heart Day. Alfred Carnes, a member of the order who went to school with Donald Dixon at East Rome, said the idea of having a monument erected has been discussed for more than 20 years. But over the last decade, raffles and fundraisers were held to reach this goal. And Lindsey Monument Co. was given the go-ahead to make it. A monument for those lost in Vietnam, Carnes said, is needed because these soldiers were not met with military parades. “There wasn’t anybody waiting for these guys,” he said, adding that the monument helps to make amends for that. 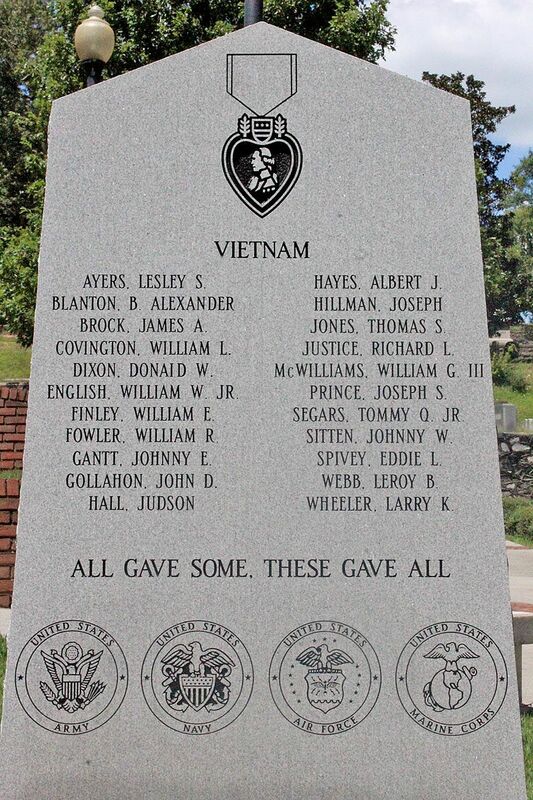 While Allen Spivey read out the names on the monument, he eventually reached that of his cousin Eddie Spivey, a crew chief on a helicopter he was shot out of. Allen Spivey had returned to Rome from Vietnam when he received news of his cousin’s death. Those who never served in the war will never truly grasp what it was like over there, Spivey said. No matter how much is explained or shown to them, the understanding of the experience is left to those who lived it, he said. When the ceremony ended, members of the Military Order of the Purple Heart climbed into two military Jeeps, turned on to South Broad Street and rode away — an American flag on the back of each lifting with the wind.